Yeah! I had time to squeeze in another sketch before we move!!! 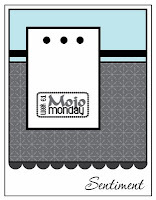 This is the Mojo Monday sketch that can be found HERE. I have been trying to use up some of my CTMH papers (new ones are coming soon!) so, these cards I used the Boom-Di-Ada paper pack, my Stickease are used for the scallopped bottom and the tag, hollyhock twill and colonial white twill were used behind the tag and a hollyhock concho and garden green brad were used in the tags. Additionally I stamped Happy Birthday using Octobers SOM - Annotations in Barn Red ink, I also distressed the edges using the Barn Red ink. Enjoy!